You will learn the basics of the sport and get a chance to try it out on the ice. However… pre-registration is completely SOLD OUT! There will be limited walk-in spaces available, so you can still head down and check it out, but you may have to wait a bit. PCC is about 45 minutes south of Keene, NH, in Petersham, MA. More info can be found on the club’s website. Another option is to pay for a Learn to Curl session on February 19, 20, 21 or 24. In these sessions you will get to learn all about the sport and get a chance to get out on the ice and learn how to play. SPACES ARE FILLING UP FAST for the Learn to Curl sessions – so sign up on the PCC Learn to Curl page if you want to join in. And if you would like to help us bring curling to the Monadnock region, please fill out this form to let us know you are interested! This entry was posted in Uncategorized on February 17, 2018 by Dan York. I (Dan York) normally curl out of PCC and find it a great place and great community. I’d strongly encourage everyone to check it out. If we are to build up interest in curling in the Monadnock region, the Petersham Curling Club is a great place for people to get started! This entry was posted in Events, Learn To Curl and tagged Petersham CC on October 7, 2017 by Dan York. 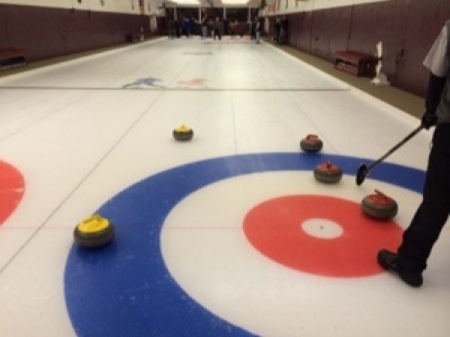 Ever wanted to try out the awesome sport of curling? Well, here’s your chance! On Oct 4th, 5th and 7th at 6 PM, Petersham Curling Club will be holding Learn to Curls. There will be plenty of great instruction from experienced curlers, both on and off the ice, to get you out there and throwing some stones! (And maybe even get in a game…) The cost is $40 per person and all we ask is that you come with sturdy shoes with clean soles (we’ll provide all the other equipment). The age limit is 5 years and older, so bring your kids, too! Respond to this post and we’ll get you on the list — it fills up quick, so don’t wait. Come try the Olympic sport of curling! More information can be found on the PCC Learn to Curl page. Petersham Curling Club is the closest curling club to our region. It’s about 45 minutes south of Keene, NH, down Route 32. This entry was posted in Events on October 4, 2016 by Dan York. Want to learn more about curling and help bring it to the Monadnock region? Let us know you are interested! This entry was posted in Uncategorized on March 24, 2016 by Dan York. Want to give curling a try? 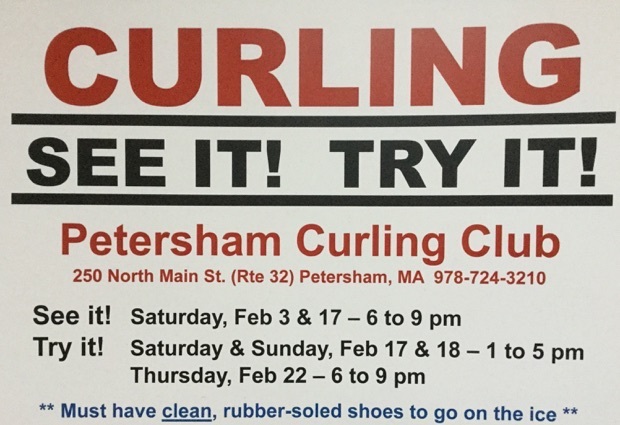 On this coming Saturday, March 26, 2016, the folks down at the Petersham Curling Club, about 45 minutes south of Keene, NH, in Petersham, MA, will be offering two 3-hour “Learn To Curl” clinics fro 10am – 1pm and from 2-5pm. They are happening March 26th and there are 2 slots — 10AM-1PM and 2PM-5PM. You get on-ice instruction from experienced curlers, use of curling equipment and a lot of fun (even get in a game!). Just remember to wear sneakers or shoes with a sturdy flat sole. The cost is just $40, and if you decide to join the club, this amount will be deducted from your membership dues. Respond to this post and I’ll put you on the list, as each slot is limited. Feel like an Olympian for a day — try out curling! See you on the ice! For $40 you get 3 hours of instruction and the chance to try out the sport! To sign up you can reply to the post on the Petersham Curling Club Facebook page or send an email to Ted Paul. This entry was posted in Events and tagged Petersham CC on March 23, 2016 by Dan York. 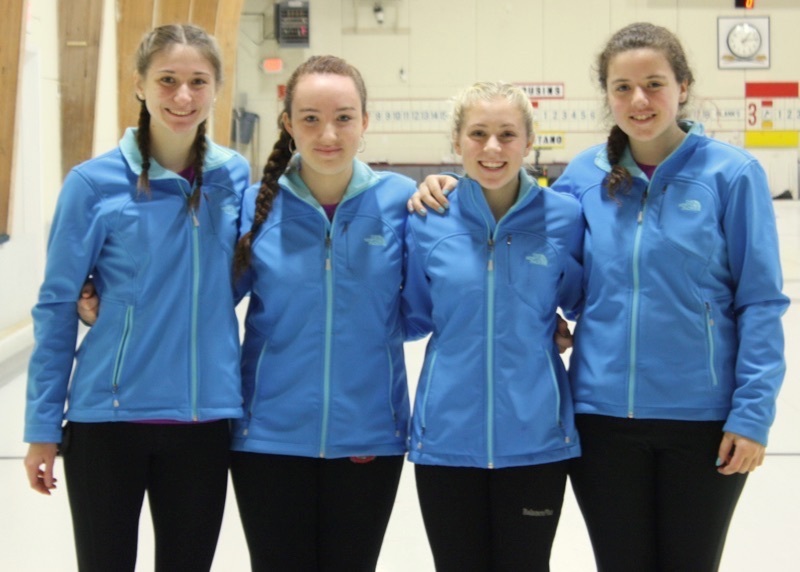 We are delighted to announce that Keene’s Chloe York will be playing in the USA Curling Junior National Championships in Willmar, Minnesota from January 16-23, 2015 as one of the top 10 Junior women’s curling teams in the USA! Last week at the regional “playdowns” (tournament), her team won one of two spots from the eastern USA for the “Nationals”. The team will now travel to Minnesota starting January 15 to compete against nine other teams. Chloe, on the right in the photo, is 13 years old and an 8th grade student at the Monadnock Waldorf School in Keene. Chloe started curling in 2011 at the Petersham Curling Club about 45 minutes south of Keene in Petersham, MA. Her team is led by skip (captain) Rebecca Rodgers, 15, also from Petersham Curling Club, and includes Anna Cenzalli, 14, from Cape Cod Curling Club, and Elizabeth Janiak, 14, from the Nashua (NH) Country Club. Chloe plays the “lead” position that throws the first rocks in a game. All of the girls have been curling for 5-8 years and have been playing in competitive bonspiels (tournaments) throughout the region. If you are with a corporation or other entity that might be willing to help financially, please contact team coach Dan York at 603-439-0024 or dyork@lodestar2.com . If you would like to follow the activities of the team over the next few weeks as they prepare for and then compete at the 2016 Junior National Championships, please follow the team on Facebook at https://www.facebook.com/TeamRodgersCurling where they will be posting updates. Thank you to everyone in the area who has already helped out the team! The girls are so excited for this incredible opportunity to play at a national level! P.S. Wouldn’t it be great if we could offer the sport of curling in Keene? Please let us know you are interested! This entry was posted in Curling, News on January 4, 2016 by Dan York. 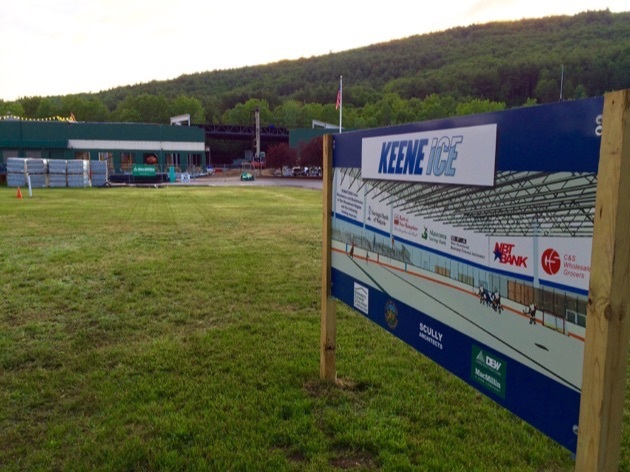 Congrats to Keene Ice On The Start Of Their Construction! Congratulations to the great folks over at Keene Ice on the start of their construction on Marlboro Street here in Keene! It’s been great going for morning runs over the past couple of months and watching the construction evolve. They’ve been posting some photos and comments over to their page on Facebook and it’s been fun to see. People have asked me about whether we’d be able to have any curling at the new Keene Ice arena. Given the fact that there is an extremely heavy demand for ice time for hockey leagues, figure skating and other ice activities, especially in light of the fact that Cheshire Ice Arena (our one other ice arena in the area) will not open next year, it’s highly unlikely that we’ll be able to figure out a way to do much in the way of curling at the Keene Ice arena. I wrote last year about the challenges of scheduling in getting a curling club going at an ice arena and that really remains the biggest challenge. I spoke with one of the Keene Ice folks earlier this year and the reality is that getting more than just a couple of hours at odd times is not likely to happen. I think it’s awesome for them that they have so much demand! And, as someone who enjoys ice skating, I’m very much looking forward to skating at the new arena! I wouldn’t rule out entirely doing something at the Keene Ice arena… even if it were just some demonstrations and “learn to curl” sessions at some point in time… but our focus continues to be on how we can identify a place for some dedicated curling ice that could let us grow the kind of curling club and curling community that we’d like to see. If you’re interested, please do join with us and let us know your interested! And if you get a chance to drive by the Keene Ice facility on Marlboro Street, do check it out – it’s great to see! Let’s make Keene a winter sports destination! P.S. And yes, in addition to the scheduling, curling ice is also different from skating ice… although there are many ice arenas that work hard to get their ice closer to what you can get at a dedicated curling club. This entry was posted in News and tagged Keene Ice on June 17, 2015 by Dan York. We are so VERY close to beginning construction on the new arena…Please show your support for Keene ICE by attending tonight’s City Council meeting at 7:30pm, when the Council will be updated on the project before the final agreements are signed and we can started building your new rink! If you can get there to support Keene Ice I would encourage you to do so. Unfortunately I have other plans (concert tickets) but I will be hoping all goes well for them. We’re not exactly sure what we’ll be able to do with the new arena in the way of curling, but we definitely believe this region needs this new arena as a way to bring more winter sports activity to the area. ThinkRink! This entry was posted in News and tagged KeeneIce on February 19, 2015 by Dan York. These are the best Men’s and Women’s teams in the US all competing to be “Team USA” and represent the USA in the World Curling Championships coming up for Women on March 14-22 in Sapporo, Hokkaido, Japan and for Men on March 28-April 5 in Halifax, Nova Scotia, Canada. We should see some outstanding curling this week! 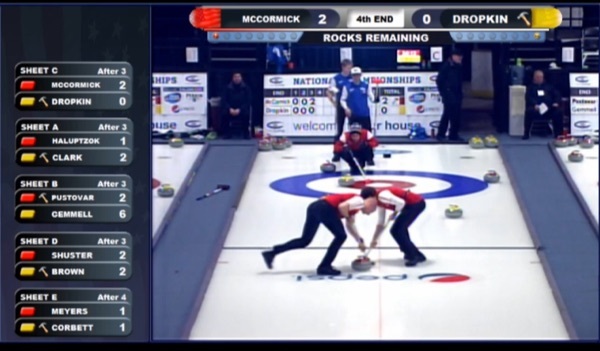 This entry was posted in Curling, Events, US Curling Association and tagged USA Curling on February 18, 2015 by Dan York. Interested in watching a curling game played by youth? Earlier this month I streamed some of the games of the Nashua Juniors Curling Bonspiel (ages 12+) coming out of the Nashua Curling Club in nearby Nashua, NH, and this is one you might enjoy as it was a well-played game with a nail-biting finish! My 12-year-old daughter Chloe was one of the players and I tried throughout the game to provide some commentary about what was going on. This entry was posted in Curling, Videos, Youth Curling and tagged Juniors, Nashua on January 29, 2015 by Dan York.